I was going to write today about "mordros" - the sound of the sea. I managed to record some short videos of the stream running into the sea and, as the gradation changed from the smaller to larger stones as we walked along the beach, the changing resonance of the crunching of our shoes on the pebbles. They took too long to load though. Never mind. Mordros is another Cornish word, used by Kurt Jackson, an artist who lives in Cornwall. You can read about his work here, which is also where I came across the word gloose and here. Mordros is the sound that I try to conjure up when I relax at the end of my yoga class and I'm going to be trying to hold on to it over the next week as I return to the rhythm of everyday life. We also found some lovely Cornish walls. 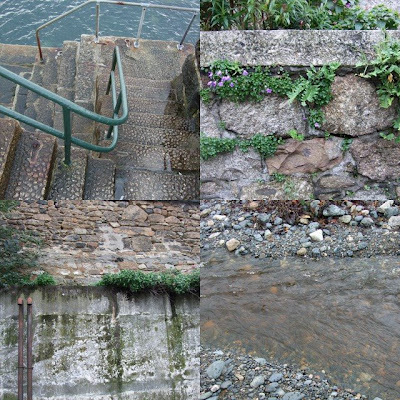 We walked one evening along the beach path to Newlyn, marvelled at the size of the granite stones used to build the harbour walls and the labour that went into the construction . On our way back we watched a lone fishing boat come into the harbour with its single light aloft on a pole. The next day we went back and found gardens full of agaves and succulent paths, spleenworts and ferns growing in the granite walls. Somehow the pace of time changed in Cornwall. It was as if Greenwich Mean Time warped into some other tempo. We visited friends, saw paintings and drawings and people, ate ice cream before the season ended, learned about plants that would like living in the London Heat Puddle at the marvellous Hardy Exotics. we brought home second hand books, plants, anemones, soleil d'or, pasties (for the boy), saffron cake, a fire brick from an ironmongers in Hayle (something we have needed for ages). The saffron cake and pasties have gone already. The flowers are giving pleasure here and elsewhere. The plants will be off to their new homes this week. The fire brick will be serving its purpose all through the winter. And the sound of the sea, I'm rather hoping, will sustain us for a long time. What a delightful post and full of nostalgia for me as my late husband was Cornish (with Cornish roots that could be traced back to the time of the Domesday Book). Re saffron cake: in my experience, it disappears almost as soon as you put it on a plate . . . Your wall photos are fantastic! I too, by some coincidence, have been gathering some sounds of sea, seashells crunching underfoot etc. I will be at Prick Your Finger tomorrow all day from around 11am; not sure if that is in your 'hood, but do come along and introduce yourself if you have 1/2 an hour to spare!